Damage of tendons of superficial and deep flexors and extensors of a complex treatment: surgical stapling, immobilization, therapeutic physical training, in the following - physiotherapy and massage. The duration of immobilization of individual - from 3 to 6 weeks. Therapeutic physical training in the I period is assigned to the 2nd day after the operation and lasts until the end of immobilization. The specific objective of this period is to combat edema and congestion in the fingers and hands. 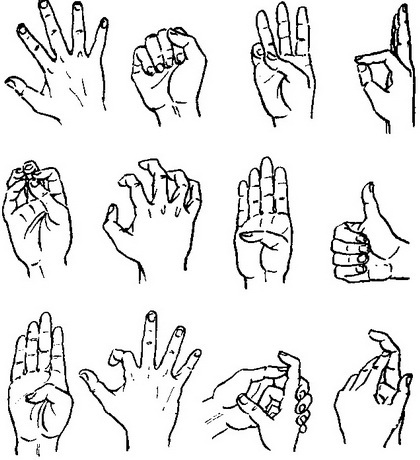 On the background of General developmental and breathing exercises are active movements in joints that are free from immobilization (breeding and bringing fingers, bending and straightening, contrasting with the first finger, circular motion in both directions, clicks, flexion and extension of the first phalanges, all kinds of passive movements in the nail phalanxes with small amplitude, not causing pain, Fig. 18). The number of repetitions of each exercise 2-6 times, and the whole complex is 8-10 times a day. If the damage flexor active flexion (if the damage extensor - extension is given within plaster. Apply also active movement for the elbow, shoulder joints in all directions. In the second period after immobilization within one month limit movement in evidence if the damage flexor and bending at the damage extensor. The movements are carried out with the partial amplitude commit each phalanx. Are active movement in warm water (36-38 degrees). Appointed paraffin. Develop skills grasping functions - first, seizing large items (cylinders, cones, cubes, and then small (matches, beans, peas and other). For softening the impact on the scar is recommended to do modeling from the warm wax, paraffin wax, clay. Very effective use different tools for targeted education of living and working skills. If the damage extensor cautiously and gradually included exercises flexing with each commit the phalanges, exercises in warm water, paraffin and development grasping function. In the third period improving complex movements of the fingers, hands and reduced mobility of each joint is damaged finger. Final recovery occurs after 4-8 months.